5 Spring Outfits Ideas | Everything Under $40! BUT while I’m gone, the blog will keep going. I’ve lined up some awesome guest bloggers at the beginning of next week to keep things new and interesting. I’ll be back battling jetlag and trying to put together some great travel posts for you before you know it! Have a great weekend! I realized the other night that I’ve gone almost the whole month without writing about my 225 cover! 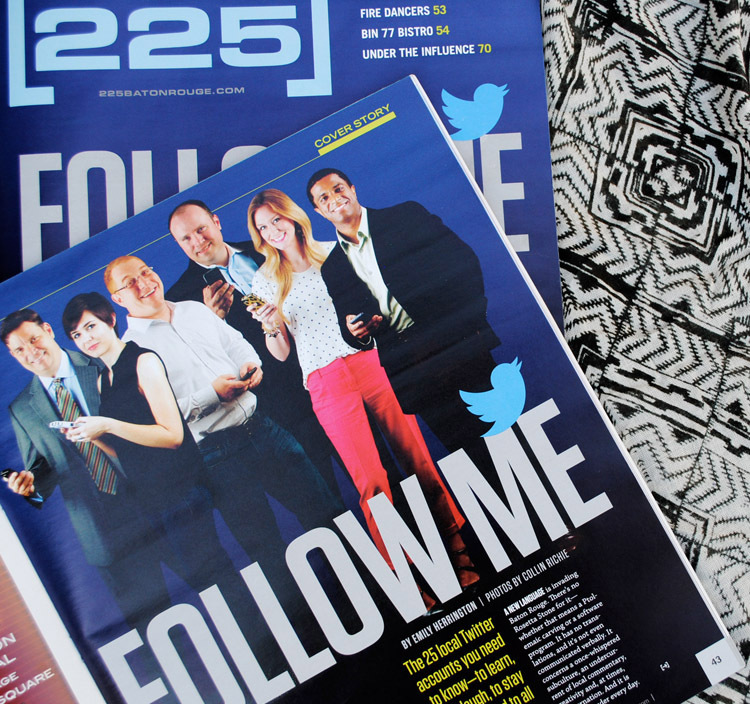 I cannot even tell you how grateful and humble and just flat out flabbergasted I was when I was asked to be on the cover of the June issue featuring some of the Top 25 Baton Rouge Twitter accounts. 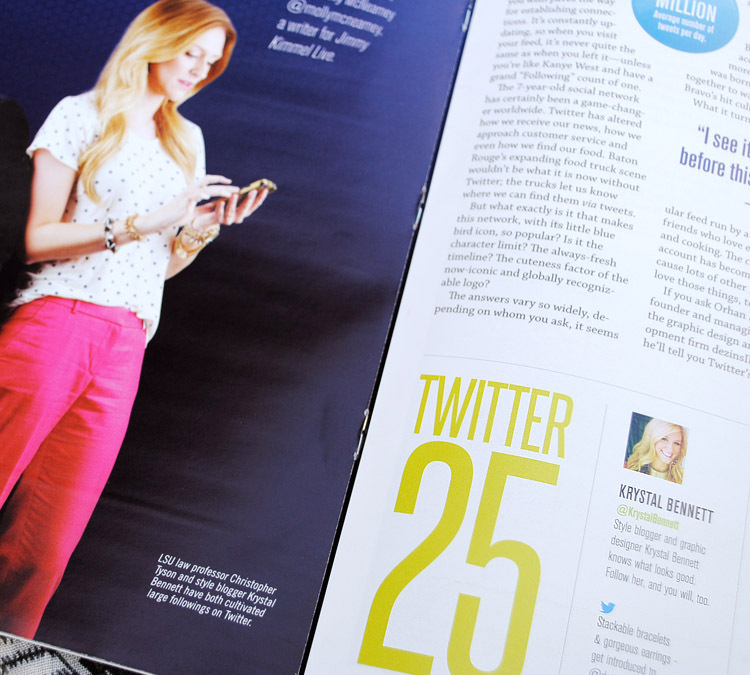 Social media has been – and still is – a constant learning experience for me. I get major tweet and instagram anxiety. Is this witty enough, how should I word this, can this be misinterpreted… I would estimate that it takes me 3-5 minutes to compose a tweet before it actually goes out and even longer for Instagram because I ponder over filters for days. Literally, days. I’m super cautious of what gets sent out and how it can reflect not only my blogging business, but also my full-time job. But most importantly, I want it to accurately reflect ME and my personality. What most people do not realize – social media takes up large chunk of my life. Planning, scheduling, correctly tagging handles seriously adds up especially when I’m working with different brands. I’ve designed a social media template sheet to help me organize hashtags and phrases as soon as they pop into my head. Quite often, I’ve caught myself wondering if it’s even worth all the work – and THIS cover confirms for me – Yes, it’s definitely worth the work. It means that someone is following and someone likes what they are reading, and that’s all that matters. So THANK YOU to everyone following along on Instagram and Twitter. 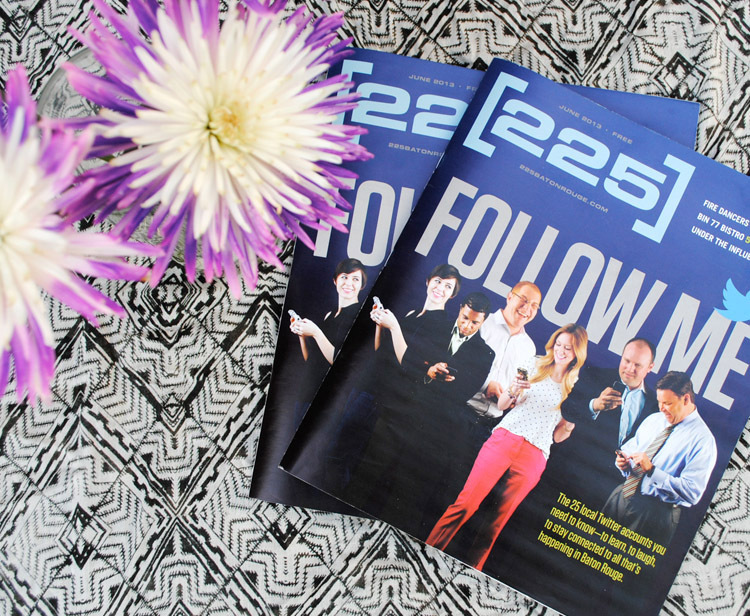 And THANK YOU to 225 for including me in your outstanding list of 25. I only hope my tweets and photos continue to live up to your expectations! Tank and koozie c/o Fraternity Collection; Jack Rogers jellies c/o Head Over Heels BR; white denim shorts; straw fedora (similar); lucite necklace (similar); stone bracelets c/o Dotted Tusk; beaded Kush bracelet c/o Rosena Sammi; vintage gold bracelets; white watch (similar); Stella & Dot renegade cluster. Let me introduce you to a fab company that I recently had the opportunity to collaborate with – Fraternity Collection. Yes, yes – I’ve long been out of undergrad and my sorority, but believe me when I say I am not trying to relive the past. 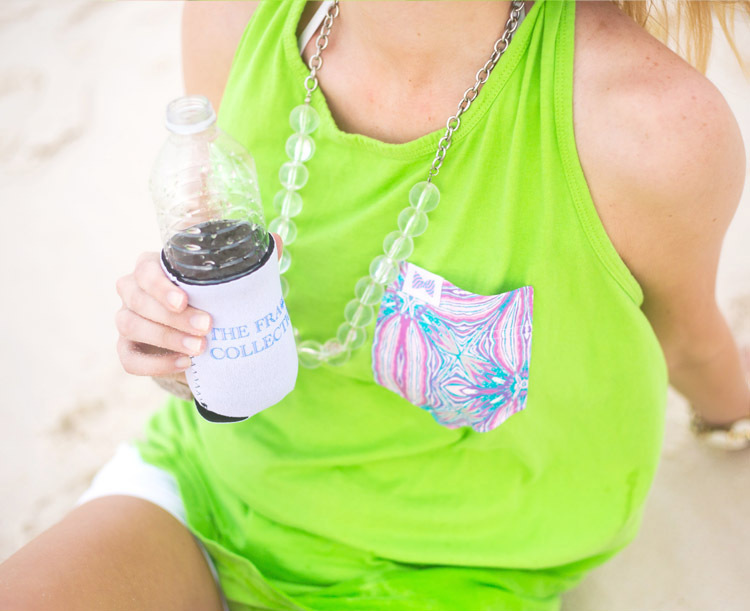 Fraternity Collection is more of a do-it yourself t-shirt company. You pick your shirt style, the shirt color and the pocket pattern (there are tons of patterns to choose from!) and voila, they sew up your custom shirt for you. 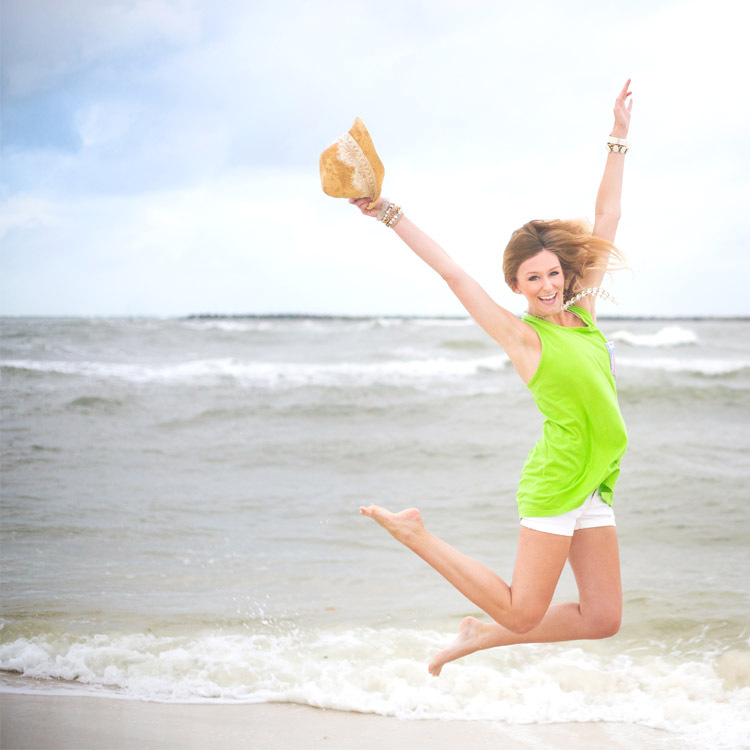 My favorite style is the tank for summer, so I chose to use mine as a swimsuit coverup on the beach, but there are also short-sleeve and long-sleeve options as well as men’s sport shirts. Plus, they put these cute pink and blue bowties on everything including koozies… your drinks have never looked so charming. Another beach must-have is a pair of shoes that can withstand the sand and water. There’s nothing worse than getting sand in your good sandals and then never getting it out. Luckily, the brilliant people over at Jack Rogers USA decided to make their popular Georgica sandal in jelly material making them resilient to sand and water. You just cannot mess these guys up! They come in bright white or fun colors like aqua and berry too. If you’re local, Head Over Heels in Baton Rouge, carries Jack Rogers including the jellies in case you want to head over and check them out! You might have also noticed a new bangle that I’m wearing from Rosena Sammi. I love these beaded bracelets added with smaller, stacked bracelets. I don’t normally wear cuffs or large bracelets everyday because sitting at a computer, they make it difficult to keyboard and mouse around. BUT when on vacation, I try to break out all the big guns in my bracelet arsenal. More from Rosena Sammi to come! Right now, I’m really loving this blue and mint color combination. Most likely because it reminds of water… the ocean, a pool, anywhere with waves crashing. But also because these colors look really good against nicely tanned skin. 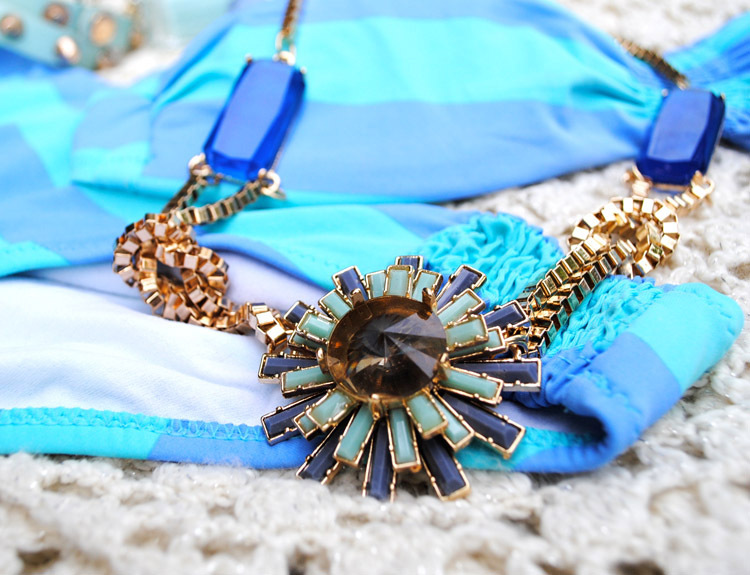 If you’re looking for a fresh color combo to sport this summer definitely consider trying this one! I am one of those people who carry obnoxiously big purses (think carry-on bag) because I have so much stuff that I carry around on a daily basis. Things get added and removed but, I have a constant group of items that I must have with me at ALL times. If one is not there, I tend to panic. Right now, I haven’t replaced my empty Burt’s Bees yet, and it’s giving me anxiety and chapped lips. Yes, I’m really this dramatic about chapstick. Here are my purse must-haves! 1. Sunglasses – Normally, you will find two or more in my bag at one time. 2. Purell – I have one on my desk too. 3. Field Notes – c/o my boss who must know I am addicted to making lists bc he’s given me two of these already. 5. 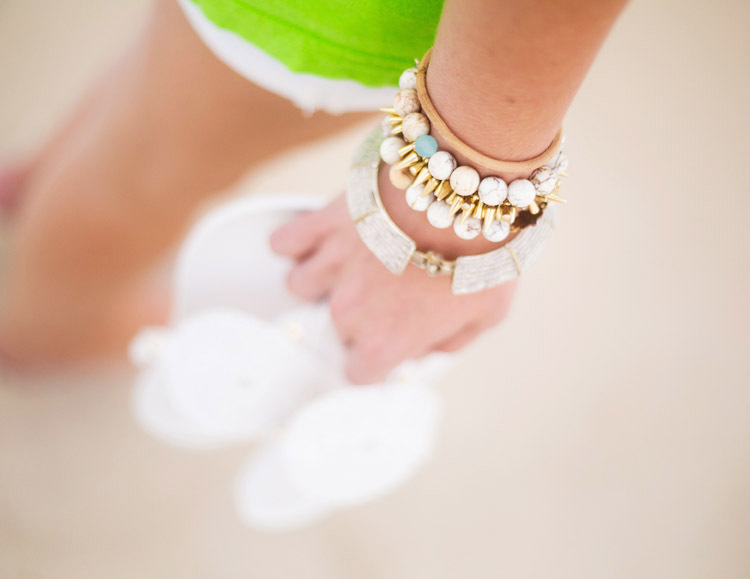 Hair elastics – These from Goody also double as pretty wrist wear. 6. Bobby pins – Necessary for my impromptu bun hair, and they’re always mysteriously disappearing. 7. Lipcolor – For when you leave straight from work to go to an event/dinner/etc. 8. Sharpies – I have three in my purse right now. The only thing I use to address packages. 9. Pilot V7 Rollerball pen – Doesn’t everyone have a favorite pen type? 10. Burt’s Bees – Take away my Burt’s Bees, and you’re putting your life in jeopardy! 12. Rollerball perfume – Jimmy Choo is one of my favorite scents. 13. Backup lip product – An option between chapstick and full-on lipcolor. 14. iPhone – Besides the computer, my phone is the most important component to keeping up this blog! Do you have must-have items in your purse? Share!